Since sweeping to power in May 2014 in India’s biggest election victory in a generation, Prime Minister Narendra Modi has made his impact more in diplomacy than in domestic policy, a realm where he faces a core challenge similar to that of his Japanese counterpart and ideological soul mate, Shinzo Abe — to lead his country toward greater economic and military security. Modi, like Abe, has surprised many by investing considerable political capital in high-powered diplomacy. But Modi, a provincial leader, came to office, unlike Abe, with little foreign-policy experience. In recent months, foreign leaders have made a beeline to call on Modi — ranging from Chinese President Xi Jinping to U.S. President Barack Obama, who will be the guest of honor at India’s Jan. 26 Republic Day parade, a year after Abe had that privilege. Modi, after hosting Russian President Vladimir Putin in December, is preparing to receive Obama at a time when U.S.-led sanctions against Moscow have underscored the risks of a new Cold War. No American president before was the chief guest at India’s Republic Day. Modi has also sought to strengthen bilateral partnerships with several other powers, including Japan, Israel, Germany and Australia. Building closer ties with important democracies has become the leitmotif of his foreign policy. For example, his much-photographed bear hug with Abe in Kyoto has come to symbolize the dawn of an alliance between the world’s largest democracy and Asia’s oldest (and richest) democracy. Likewise, Modi is enhancing defense and economic cooperation with Israel, with India ordering more Israeli arms in the past six months than in the previous three years. When Modi won the election, his critics claimed the nationalist would pursue a doctrinaire approach in office. However, one trademark of Modi’s diplomacy is that it is shorn of ideology, with pragmatism being the hallmark. Nothing better illustrates his pragmatism than the priority he has accorded to restoring momentum to India’s relationship with America. There was concern in Washington that Modi might nurse a grudge against the United States and keep American officials at arm’s length. After all, the U.S. continued to deny Modi a visa over his alleged involvement in the 2002 anti-Muslim riots in his home state of Gujarat even after he had been cleared of any wrongdoing by an inquiry appointed by India’s Supreme Court. Yet, when he won the election, Obama was quick to telephone him and invite him to the White House — an invitation Modi gladly accepted, given the critical importance of America to India. 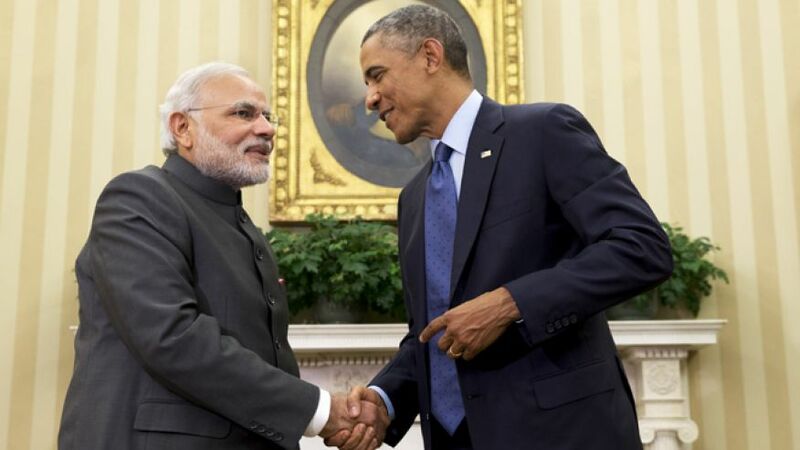 Modi’s White House visit last September helped him to establish a personal rapport with Obama. Obama’s impending India visit represents both a thank you to Modi for rising above personal umbrage and an effort to lift the U.S.-India relationship to a higher level of engagement through the major new opportunities being opened up for American businesses by Modi’s commitment to pro-market economic policies and defense modernization. The U.S. already conducts more military exercises with India than with any other country. And in recent years, it has quietly overtaken Russia as the largest arms supplier to India. Another example of Modi’s pragmatism is his effort to befriend China. He has invited Chinese investment in his plan to modernize India’s infrastructure, especially railroads, power stations and industrial parks. China’s foreign direct investment in India, however, remains trifling, with Chinese companies preferring to import primary commodities from India while exporting an avalanche of finished products. China represents Modi’s diplomatic gamble, as was highlighted when Xi’s visit to India four months ago coincided with Chinese military incursions into India’s Ladakh region and a Chinese submarine’s visit to Sri Lanka. The submarine visit underscored an emerging new threat to Indian security from the Indian Ocean, a region where China has been building ports and other infrastructure projects to extend its strategic clout and build naval presence. Another regional adversary, Pakistan, poses a different set of challenges for Modi, given the Pakistani military’s use of terrorist proxies. More than six years after the horrific Mumbai terrorist attacks, Pakistan has yet to begin the trial of the seven Pakistani perpetrators in its custody. Adding insult to injury, Pakistani authorities recently helped United Nations-designated terrorist Hafiz Saeed — the architect of the Mumbai attacks — to stage a large public rally in Lahore city, including by running special trains to ferry in participants. Modi’s Pakistan policy blends a firm response to border provocations with friendly signals. For example, he invited his Pakistani counterpart, Nawaz Sharif, to his inauguration and asked Indian schools to honor the victims of the recent Peshawar attack in Pakistan with a two-minute silence. At home, Modi has shaken up the diffident foreign-policy establishment with his proactive approach and readiness to break with conventional methods and shibboleths. By taking bold new tacks, Modi is charting a course to boost India’s strategic influence both in its neighborhood and the wider world. Indeed, Modi has put his stamp on foreign policy faster than any predecessor, other than the country’s first post-independence prime minister, Jawaharlal Nehru. Yet Modi appears to have no intent of enunciating a Modi doctrine in foreign policy. He wants his actions to define his policy trademarks. His actions have already started speaking for themselves — from his moves to engineer stronger partnerships with Japan and Israel (countries critical to Indian interests but which also courted him even as the U.S. targeted him) to his mortars-for-bullet response to Pakistan’s ceasefire violations. His firm stand at the World Trade Organization on food stockpiling, central to India’s food security, demonstrated that he will stand up even to a powerful, rich nations’ cabal. More significantly, Modi’s policy appears geared to move India from its long-held nonalignment to a contemporary, globalized practicality. This means from being nonaligned, India is likely to become multialigned, even as it tilts more toward the U.S. and other democracies in Asia and Europe. Yet, importantly, India will continue to chart its own independent course. For example, unlike Japan, it has refused to join American-led financial sanctions against Russia. After a long era of ad hoc and reactive Indian diplomacy, the new clarity and vision Modi represents is widely seen as a welcome change for India.